Well known respectable senior career diplomat Dr Muhammad Khalid Ejaz has arrived in Australia and assumed the charge of the Head of Chancery/Deputy High Commissioner for Pakistan to Australia. Dr Khalid Ejaz is good speaker, nice gentleman and popular professional connection, highly skilled officer of the Ministry of Foreign affairs. On the behalf of the Australian Pakistani community, the Editorial board of Sada-e-Watan Sydney, welcome Dr. Muhammad Khalid Ejaz and hope he will be serve better under the command of Her Excellency Naela Chohan. Dr. Muhammad Khalid Ejaz holds a Master’s degree in International Public Policy from the Paul H. Nitze School of Advanced International Studies (SAIS) of Johns Hopkins University in Washington, D.C. He was a Lecturer/Demonstrator at Nishtar Medical College in Multan, Pakistan before joining the Pakistani Foreign Service in 1998. He served within various divisions of the Ministry of Foreign Affairs including: Afghanistan, ECO, South Asia, and Personnel. He remained posted as Second Secretary at the Embassy of Pakistan in Kuwait from August 2002 to December 2005. He has received training from the Civil Services Academy in Lahore, the Foreign Services Academy in Islamabad, the Japanese Language Training Institute in Kansai, Japan, Human Soft, the Centre for European Studies in Strasbourg, France, the Singapore Mediation Centre, the National Institute of Management, and the School of Public Policy in Pakistan. Between 2008 and 2009 he was a visiting faculty member of the Faculty of Contemporary Studies (FCS), the National Defence University in Islamabad, and Bahria University. 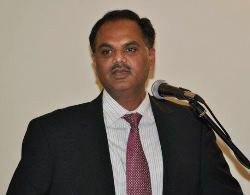 He joined the Consulate General of Pakistan, Los Angeles in October 2009. He is married and has three children.